Socotra’s famous Dragon’s Blood Trees in Homhil, Socotra, Yemen. The Socotra Archipelago lies several hundred kilometres off the coasts of Yemen and Somalia, placing it in a unique position in the middle of the Indian Ocean and Arabian Sea. 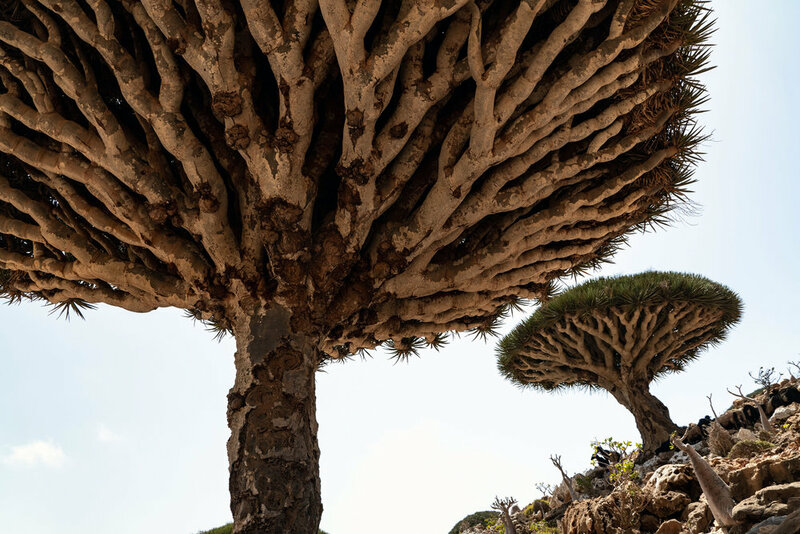 It has been called “one of the most alien places on Earth” and for good reason: about one third of Socotra’s species are endemic to the archipelago. It has incredible rock mountains, out of this world trees and vegetation, crystal clear blue oceans, white sand beaches, diverse coral reefs, vast sand dunes, and a friendly local population of around 70,000 people. Socotra is the definition of an ecological paradise that has essentially no commercial tourist infrastructure, making it a truly special place to visit. For those who know about this, then this last paragraph simply reconfirms what they’ve already heard— Socotra is incredible for nature lovers, hikers, adventure seekers and off the beaten path explorers. This being said, now we must remember that Socotra is part of Yemen. A country that’s been in a state of war, conflict and foreign intervention since 2015. So is Socotra safe to visit? And if one were even thinking about visiting, how on earth would you get there, given that Yemen is in a state of war? Want to go to Socotra? The reality of the situation is actually quite straightforward. Socotra is conflict free. The war never came close to spreading to the island. Socotra is quite autonomous from Mainland Yemen, and it has been for some time. It has its own culture and language, a small population, and a lot of untamed nature. This is not to say there have not been repercussions for the island due to the conflict in the mainland; it just means that these repercussions have not affected individual safety on the island. After the war broke out, the United Arab Emirates and Saudi Arabia established a coalition force in the country, with the UAE largely responsible eastern and southern Yemen— including Socotra. There’s a small UAE military base on the island, while operations of security have been returned to the Yemeni government and military. The other major issue caused by the war in the mainland relates to transportation— Socotra used to benefit from regularly scheduled commercial flights on Yemenia and Felix Airways from Sana’a, Al Mukalla and Dubai. These all shut down in early 2015 as the war raged on in the mainland, essentially severing Socotra’s connections with the outside world. Local shipping boats continued moving people and goods between Socotra and Al Mukalla on the Yemeni mainland, and an occasional rat-infested cement ship makes the four-day trip over to the island from Salalah. The war lead to severe price inflation, an unstable Yemeni Rial, and a loss of transportation options for locals, let alone tourists. So, after just returning back from Socotra a couple weeks ago, I can confirm that the island is very safe to visit. The people are friendly and hospitable, and while basic, there is enough infrastructure and supplies on the island to sustain locals and visitors alike. There is no violent conflict on Socotra. While Socotra is conflict free, not the same can be said about mainland Yemen. Currently, there is only one safe way (that does not involve a 4-day rat infested boat ride that may or may not depart) onto the island. Every Wednesday morning Yemenia (Yemen’s flagship carrier) has a flight from Cairo to Socotra. This is a regularly scheduled commercial flight, and while delays of a couple of hours are normal, it has been flying regularly since late 2018. If you’re interested in learning more about this flight, check out our article on How to Get to Socotra. The Yemenia flight from Cairo to Seiyun to Socotra waits for transit passengers at Seiyun Airport. Outside the arrivals hall at Seiyun Airport in Hadhramaut, Yemen. This flight does make a stop in Mainland Yemen on the way to Socotra, and based on several messages and emails I’ve received asking about the safety of this stop, I’ll give an in-depth description of what it was like. The flight leaves Cairo around 2am (3am for us, we were delayed as they finished loading up the place with luggage) and flies to the city of Seiyun in central Yemen. Seiyun is the gateway to the Hadhramaut Valley, one of the most picturesque regions of Yemen known for the famous “sand castle” city of Shibam. However, for the last decade or so Hadhramaut has become a stronghold for Al Qaida in the Arabian Peninsula, as it’s a backwater Sunni-majority region in Yemen. While the situation has improved over the last year, with the UAE and Yemeni military gaining control over the region, Hadhramaut is far from safe to travel in for foreigners (especially Europeans and Americans). That being said, son’t get too nervous. Seiyun Airport is secured by the Yemeni and UAE militaries and the stop here is quite uneventful. On the way to Socotra, the plane lands in Seiyun in the early morning (around 7am) and everyone it told to get off the plane. You walk right off the stairs of the plane, onto the runway and for those continuing on to Socotra, you’re directed to a waiting hall on the right hand side of the airport. There, you can use the washroom and charge up your electronics. Cell coverage works from here for most major international providers. After a while, you’ll be directed to the main waiting hall area with the other Yemeni passengers boarding boarding the flight in Seiyun for the quick hour hop over to the island. A security official from the airport will check your passport and maybe bring your passport into a back room for inspection. They told us they were looking for any evidence of travel to Israel, as any evidence of travel to Israel will prohibit your entrance into Yemen and you’ll be deported back to Cairo that same afternoon. Make sure your passport not only does not contain any Israeli entry stamps or visas, but also does not contain any border stamps from Jordan or Egypt. When the plane is ready to board you’ll get your passport back and follow the other passengers onto the plane. The total amount of time we spent in Seiyun Airport was about two hours; it was a very straightforward and simple experience. There’s a small cafe in thee airport if you need to buy any snacks, but since they won’t let you beyond the immigration counters, you’re confined to the secure part of the airport. You will pass through Yemeni immigration and customs at Socotra Airport, not in Seiyun. So that’s the play-by-play of the Seiyun stopover. There is no change of planes I should add. You board the same plane that you took from Cairo, so there is no risk of cancellation or significant delay. Travel to Socotra is indeed safe, and as long as you follow standard precautions and travel to the island on the weekly flight from Cairo, you should not run into any problems. If you’re thinking about going, I’d encourage you to do so before the island changes or the route in is closed off again. It’s a truly spectacular place. Want to go to Socotra? We can get you there.